We've been home for a couple of weeks now and everything feels like it's in disarray. We're in the midst of kitchen renovations which, as exciting as it is to be cooking outside in the carport with the tail of Debbie lashing us, I'm quite over "camping". Of course I get back to work and it's not exactly a walk in the park either, and I normally try to escape my desk in the middle of the day for a lunchtime run, but my body is still spent from the marathon and I certainly feel it my knees when I'm jogging. So it's pretty frustrating to have to wait for recovery. But anyway, enough of my complaining. I can't wait to get our house back; no more builders, painters, plumbers, electricians, tilers. They are a great crew though - the same ones we had to renovate our bathroom, so it feels all too familiar. We're almost there; tiler and plumber in today, electrician again at some point to wire up the remaining lighting and switches, painters to come through again, and I think that's about it. This is what our kitchen looks like this morning. Big difference, huh? When we got back from LA we will had bare concrete walls! So we've come a very long way. Only a couple more days to go and *hopefully* I'll be cooking on the induction stove by Thursday night. I can't wait! Over the weekend I took Kien to Extreme Edge Indoor Climbing. He went there for a birthday party once and he's been asking to go all last week. This particular place in Panmure is great. It's very big and has many walls. On Sunday Kien rode his new bike to the park. He's still growing into the bike but it fits him better than his little one now. 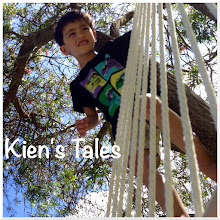 If you saw Kien's blog you would have read that we saw the bees. They are back! We've missed them. The hives were taken away in 2015 but now it looks like there is a campaign to make AKL the most liveable place for bees. I'm so looking forward to an extra long weekend! Kien wrote his story with his dad in bed last night and texted it to me. I look at these pics below and see the future flash before my eyes!